A Superman cookie jar that is the way to store you best cookies. This ceramic jar shows the Superman logo and Superman flying bye. The lid on top gives access to all the cookies you ever want. Check out this Superman Logo Cookie Jar. Never get enough cookie storage and even if they empty out quickly you still need more cookie jars. 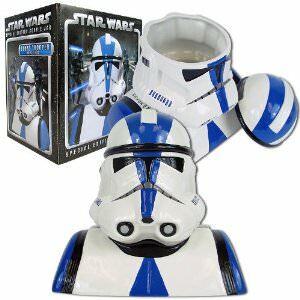 This Star Wars themed cookie jar will give you lots of fun and it is 11″ tall. This hand painted jar will give a Star Wars fan lots of fun. Go check out this Stormtrooper Cookie Jar. The TADRDIS cookie jar makes actual TARDIS sounds when you open it up, so never worry again about the cookie monster because you will hear when he opens it and catch him. 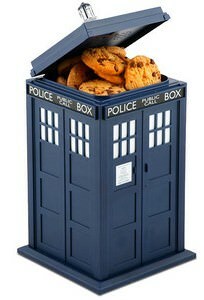 If you are a Doctor Who fan you will love getting cookies out of this. Get your TARDIS Cookie Jar.